Brian Gainor is an experienced sports marketer with agency experience as well as an extensive background working in the NFL, NFL Europe, and collegiate athletics. Please email Brian at bgainor@partnershipactivation.com to schedule him to speak at your event or for additional information. Partnership Activation is a leading sports industry resource showcasing sports marketing and sponsorship trends, insights, and best practices. Partnership Activation serves as a prominent, cost-effective medium to effectively reach sports industry professionals worldwide. 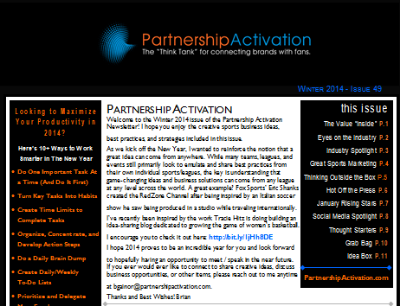 Download the Partnership Activation Rate Card Here. Please contact Brian Gainor at bgainor@partnershipactivation.com for information regarding advertising and sponsorship opportunities via the Partnership Activation Newsletter, Partnership.com, and related social channels (Twitter, LinkedIn, etc.). Brian Gainor Presents on College Athletics at NACMA from Laura Gainor on Vimeo. 2009 Ivy Sports Symposium PARTNERSHIP ACTIVATION RISING STARS Panel (Part 1 of 2) from Ivy Sports Symposium on Vimeo. 2009 Ivy Sports Symposium PARTNERSHIP ACTIVATION RISING STARS Panel (Part 2 of 2) from Ivy Sports Symposium on Vimeo.